It is a well-established fact that art transforms and contributes to society. Some artists take this responsibility more seriously than others. World renowned contemporary artist Hesham Malik is an excellent example of an artist who strives to make his art centred around human development. Hesham traces his roots to Cuncolim, Goa, where his maternal grandparents come from, and is presently celebrated as having sold the most expensive painting as an Indian artist. He presents to us his latest art exhibition Mukhâ-The Intimacy which will be showing at Carpe Diem, Majorda, Goa, from the 7th of January to the 3rd of February. The inauguration of the exhibition will be marked by the auction of one of the paintings, with the entire proceeds going towards funding the Goa based not-for-profit organisation Sethu. Planet-Goa is the online media partner for this exhibition. Mukhâ comprises of 20 artworks and has already been exhibited at Beijing and Prague before making its way to Goa. Mukhâ is Sanskrit for ‘face’ but, quite interestingly, the artist uses his art to interpret the connection between the energy within the human being that flows to the heart and the resultant facial or bodily expressions. Hesham contends that we tend to make judgements based on the face of a person or on appearances in general rather than considering the character or intention involved. He views the face and expression as two separate entities. The self-taught artist, who was expected to join the family business after acquiring his degree in International Business from Seneca College in Canada, believes that art should be produced to reflect the artist’s vision instead of catering to consumerist tastes. Having said that, he continues by explaining that he tries to draw viewers to their ‘sparkling hidden soul’ and away from the harsh reality of the world. In holding on to these ideas, Hesham realises his endeavour in the vibrant abstract figurative art that he has produced over the years, and has had art collectors comment on the veiled power and spirituality that emerges from it. Mukhâ was initially inspired by Sanatana Dharma, the eternal set of duties or spiritual practices to be taken on by all Hindus. Hesham has a lifelong history of supporting charities with his artwork. As someone who has struggled with health issues, he can express deep empathy with differently abled individuals. 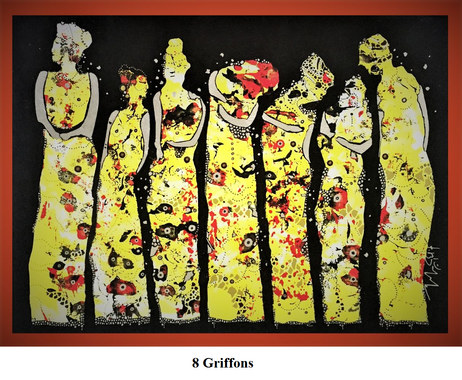 He has offered his painting 8 Griffons to be auctioned in aid of Sethu - Centre for Child Development and Family Guidance. Sethu has played an integral role is changing the lives of differently abled children and children with learning disabilities, and buiding a link between them and their families, schools and communities through its programmes of assessment, training, therapy and so on. 8 Griffons depicts 7 figurative angels where the 8th angel is the viewer, and in this particular context of being auctioned for Sethu, it represents the children at Sethu. 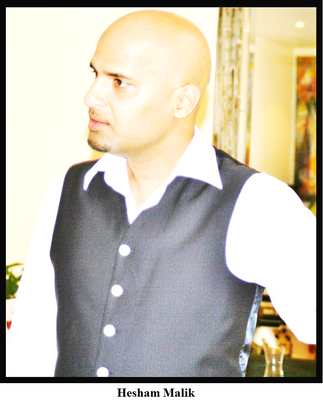 The Hesham Malik-Sethu connection was facilitated by Daegal Godinho, director of Carpe Diem. Hesham says, ‘I am always trying different ways to connect art to our people… to our children. If all of us decide to be a part of different institutions, in no time these institutions would be in a much stronger position to help the children, senior citizens, women in need, etc.’ At the same time he advises caution in selecting people and institutions to work with. While it is good to be generous, one must choose institutions that are determinedly working towards making a difference.